I've been working on some Buchla-compatible versions of several Mutable Instruments modules and I wanted to share the first two for feedback. Each module is getting a new PCB design with all the necessary changes to accommodate Buchla CV/audio levels, power requirements, etc. Dual Algorithmic Oscillator is essentially two Braids in one panel (taking a slight cue from the 258). Digital Resonator is based on Rings, with some changes to allow the internal normalizations to work with banana jacks. Both of these are in development now, with others to follow. Olivier has given his permission for this project and I'm very grateful to him for publishing his design files under an open-source license. Source files for these modules will be published under the same license (CC-BY-SA-3.0) as required. Please comment if you're interested or have feedback... I'll be sharing more details as things take shape. I was thinking about doing something similar with Clouds. Maybe Clouds forms part of your "others to follow" comment? I like how the mode + poly switch are cv-able on Rings. Nice touch. Also, Tides. Olivier said somewhere that Tides and Rings are his 2 best modules. Maybe he's onto something? and of course i like the idea a lot we have a clouds and rings in the work ourselves. Any option of cross-modulation inside the dual algorithmic oscillator or FM at audio rate ? Not sure if I'd like Braids tho. Rings and Clouds could be fine (but I have both in Euro, so I don't know how useful they would be). For quite awhile now I've been toying with the idea of getting a Braids board and doing something like this. Now I hope I don't have to! Go for it! very cool- looking forward to having both rings & clouds in my buchla setup! Definite interest. Rings is crucial, and your panel is gorgeous. Aesthetic feedback? I think you are overusing the caps italics, and could use lowercase on the lower half.. your font might be just a tad too tall or light? Also regarding layout, the mutabl faceplate lines up the attenuators with the appropriate pots, and CV input. It seems like their most intuitive layout. Where as here it seems 'brightness' and 'damping' jacks are reversed, and you will have think about it while patching. What are the extra LEDs and switch for? this could easily be what get's me to ditch Eurorack for good. Maybe Clouds forms part of your "others to follow" comment? A variant of Clouds (departing somewhat from the original) will definitely happen, more details soon. Tides is probably further down the line, but it could happen too. The format could use something like Tides since Eardrill's Periodicity was seemingly shelved. Maybe two could fit into one panel (then you could run Tides and Sheep simultaneously). Any option of cross-modulation inside the dual algorithmic oscillator or FM at audio rate? Internal cross-mod between the upper/lower sections is not really feasible (you can always cross-patch) but Braids has a few different modes that handle audio-rate FM (FM, FBFM, WTFM). There's an excellent user-created manual for Braids in this thread that explains all the oscillator modes (including the quantization scales). I think you are overusing the caps italics, and could use lowercase on the lower half.. Fellow designer? I deliberated over this quite a bit since the 200/200e use a mix of uppercase/lowercase. Aesthetically I prefer all uppercase and most of the 200-series modules use italicized caps predominantly. This also makes the overall bouma more regular and mostly avoids descenders (lowercase g/j/q/y) which allows the spacing between a label and the associated hardware to be a little more consistent. Good eye for detail. I did have the Brightness and Damping inputs swapped in an earlier iteration. 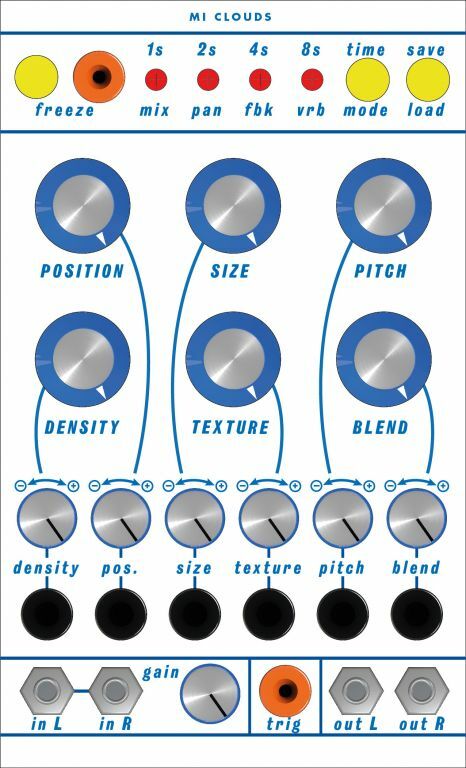 Unlike the Eurorack version there's not a neat alignment of CV inputs and knobs. If this seems confusing in actual practice I'll consider swapping them back again. On the Eurorack version of Rings there are four normalizations that use switching jacks (internal normalizations are disconnected by patching the input). One is the audio input, so that's easy. But the others can't be done with banana jacks alone. The switches control whether or not the Strum, Pitch, and Frequency inputs are active (they can be plugged in, but not routed to the MCU – this is the same as leaving the jacks unpatched on the Eurorack version). The LED indicates whether or not the input is active. Would that be for using a DC component of the output signal as a modulation source? (I'm not even sure that the Braids output is DC coupled, I'd have to check.) You could always use a cable/plug adapter or wire up a few custom cables. I was going for the precedent of the 258/259 which have multiple Tinijax outputs for the same signal. That makes it easier to do things like routing a single oscillator to a dual filter or setting up a stereo patch. Now we have micro braids i assume 2 could possibly be put behind a Euro panel ? Interested - but will they carry a Buchla price tag? super nice and cool layouts. Very happy to see them here. 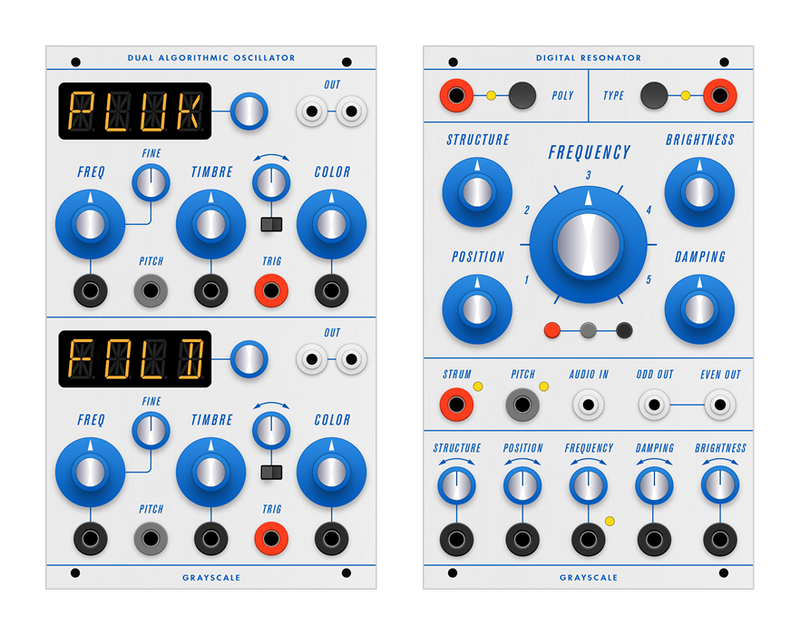 These look so damn good I'd be tempted by euro versions of the buchla versions of the euro versions.